The majority of people living near Manston Airport are against plans to operate more night flights, research by Thanet District Council has suggested. They say 73% of 2,000 residents questioned were against the proposal of the owners, Infratil. People cited potential noise levels and disturbance to sleep as their primary reasons for objecting. The airport is desperate to get some night flights for freight, to try and make a bit of money, and say they have to be given some “flexibility”. The Thanet District Council report goes to Cabinet on Thursday 10th May and will then be considered at an Extraordinary meeting of Full Council on Thursday 24th May. Canterbury City councillors have concluded that flights between 23:00 and 07:00 were ‘not justified’ given strong opposition from Herne Bay residents, and they will submit a formal objection. 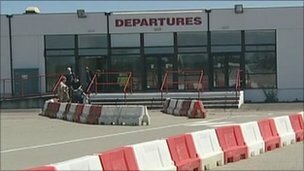 The majority of people living near Manston Airport in Kent are against plans to operate more night flights, council research has suggested. Thanet District Council said 73% of 2,000 residents questioned were against the proposal of the owners, Infratil. They cited potential noise levels and disturbance to sleep as their primary reasons for objecting. Manston’s chief executive Charles Buchanan said he was “rather surprised” by the results. He said the majority of people who had contacted the airport were in favour of night flights. “All we are asking for is a limited, managed and mitigated amount of night-time flying,” he said. The airport currently deals with passenger and commercial aircraft with a runway capable of taking Boeing 747s and Airbus A380s. Its refurbished terminal is capable of handling up to 700,000 passengers a year. Earlier this month, Infratil announced plans to sell Manston Airport, near Ramsgate, and Glasgow’s Prestwick Airport. Canterbury City Council has challenged plans for night flights at Kent’s Manston Airport, the Herne Bay Times reports. City councillors held a meeting to discuss the latest plans on Thursday and concluded that flights between 23:00 and 07:00 were ‘not justified’ given strong opposition from Herne Bay residents. In a district-wide survey, 80% of the 230 replies were against night flights, with 20% saying that they could boost the economy and create jobs, economic growth and regeneration. The council members voted to submit a formal objection. overstating the potential economic benefits. “Firstly I’d like to thank everyone who took the time to take part in this consultation. We know that it’s such an important issue for local people and that’s clearly reflected in the high level of response. The feedback from this consultation will now be considered by Councillors, alongside the findings of the Independent Assessment completed by Parsons Brinckerhoff and the proposed policy itself, to agree the council’s consultation response to Infratil. A report is due to be considered by members of the Airport Working Party on Wednesday 4th April. The report then goes to Scrutiny on Tuesday 24th April, Cabinet on Thursday 10th May and will then be considered at an Extraordinary meeting of Full Council on Thursday 24th May.